Silica is a chemically stable inorganic synthetic material. It has the benefit of providing no irritation to human skin. Silica is essentially transparent, colorless and promote a high degree of slip in products. The skin feel is generally lubricious in nature. Spherical silica imparts exceptional lubricity to loose and pressed powder products. The effect is increased ‘play time’ and a luxurious feel. Spherical products with mean particle size between 3 to 10 micron will scatter light on the surface of its particle, ie which are transparent, but give natural coverage. 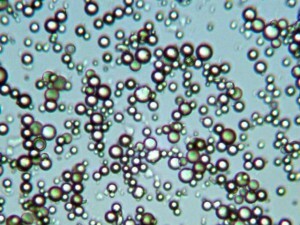 Silica Microspheres are available for purchase at Cospheric in R&D quantities or bulk.